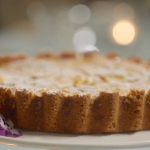 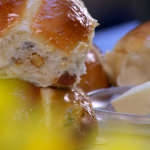 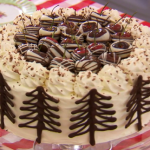 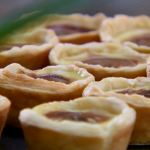 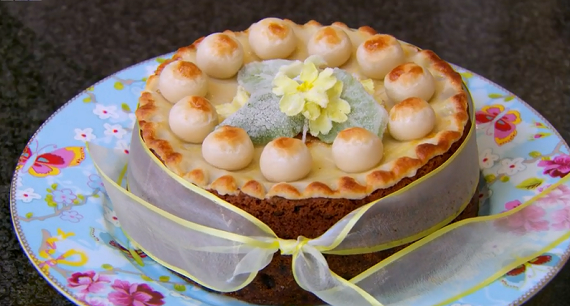 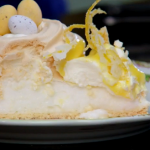 Mary Berry make a delicious Simnel cake on The Great British Bake Off Easter Masterclass. 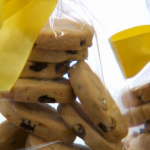 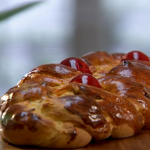 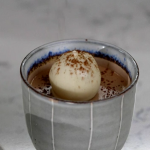 The ingredients are: 100g red or natural glacé cherries, 225g softened butter, 225g light muscovado sugar, 4 large free-range eggs, 225g self-raising flour, 225g sultanas, 100g currants, 50g chopped candied peel, 2 lemons, zest only, 2 level tsp ground mixed spice, For the filling and topping, 450g golden marzipan, 2 tbsp apricot jam and 1 large free-range egg, beaten, to glaze. 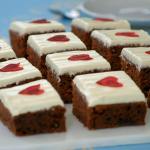 To decorate: 1 free-range egg white, organic primroses (or alternatively other edible spring flowers) and handful caster sugar.